There is very little material in the Clyde Tunnel, anyone else got any info on its creation to the present day. i dont have anything usefull to add to this i'm affraid, but did you know that the Red Bull skate board team had free reign of the south bound tunnel one night for a video shoot last summer? wonder how much that cost them. It seems that citychambers and the tunnel master will not give out info on the structure due to security reasons. Check out my profile, if you interest in the "Interests" section get in touch. If you wanted to "take out" the tunnel it wouldn't exactly require rocket science, would it?? Diesel, fertilizer, and a big truck / transit van would do the job rather easily with no need to consult any structural plans Probably best not to discuss this, "THEY" will be checking my library book records!!!! I'm interested in its construction mostly - according to another thread the workers were kept in a pressurised environment much like scuba divers, which meant they had to decompress upon finishing their shift. Another "myth" (totally unsubstantiated!!) I heard was that the shielding of the tunnel actually penetrates the river, and that a ship once collided it (again I'm sure someone mentioned it in the forums). 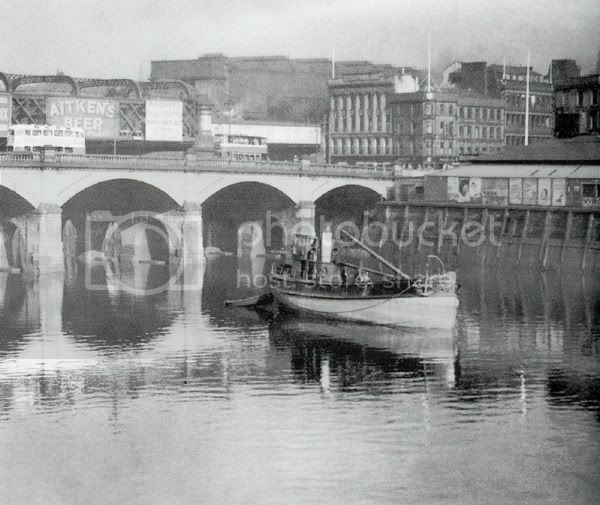 The final "thing I heard" was from a chap who was somewhat involved in bailing out/fixing the kingston bridge (surely this is a good subject too!!!).... he mentioned that the tunnels concrete walls were suffering from concrete cancer or "spalling" where the steel reinforcement within the concrete begins to rust, which causes it to expand and crack the concrete in places..... this is total heresay from the pub about 4-5 years ago now, but still interesting!!!! Anyone expand on my mad mutterings? Snapshot wrote: Another "myth" (totally unsubstantiated!!) I heard was that the shielding of the tunnel actually penetrates the river, and that a ship once collided it (again I'm sure someone mentioned it in the forums). a small trawler got 'stuck' on the tunnels under the Clyde at this location. It was said in a matter of fact kind of way, suggesting it happened regularly. Caption with it read "In the forties the Clyde was an important artery for trade. This puffer, the Faithful, laden with a cargo of sand found that low water was just too low and ran aground at Jamaica Bridge" ...this would be roughly where the underground passes under the Clyde between St Enoch and Bridge St stations wouldnt it? ...this would be roughly where the underground passes under the Clyde between St Enoch and Bridge St stations wouldnt it? Yep, I'd say that's exactly where the tunnels are CB. That's the very film I was referring to earlier in the thread. Nah - we tried that last year, and we were rubbish! REALLY rubbish... although maybe it was the quiz??? ?